Alhumdulillah, throught the tawfiq of Allah Most High we have been able to reprint the Arabic original and translation of the 40 hadith compiled by Shaykh Abdullah Saeed al-Lahji. It appears that he authored this text for the students of the Madrassa al-Sawlatiyyah in Makkah, a school where he taught for 23 years. Shaykh al-Lahji is well known in scholarly circles for his wonderful work entitled Wasail al-Wusul which is a 4 volume commentary on the Prophetic Shamail text written by Shaykh Yusuf al-Nabhani. It is due to the popularity of this work in scholarly circles and the high esteem in which the author is held that we decided to translate these 40 hadith. Added to this the fact these 40 hadith were compiled by the author for his students gave us added impetus to make this work available to others. This work was obtained in Makkah recently from a student of Shaykh al-Lahji who works in a perfume shop close to the Haram al-Makki. The means by which we located him is perhaps deserving of another blog post detailing how this occurred. 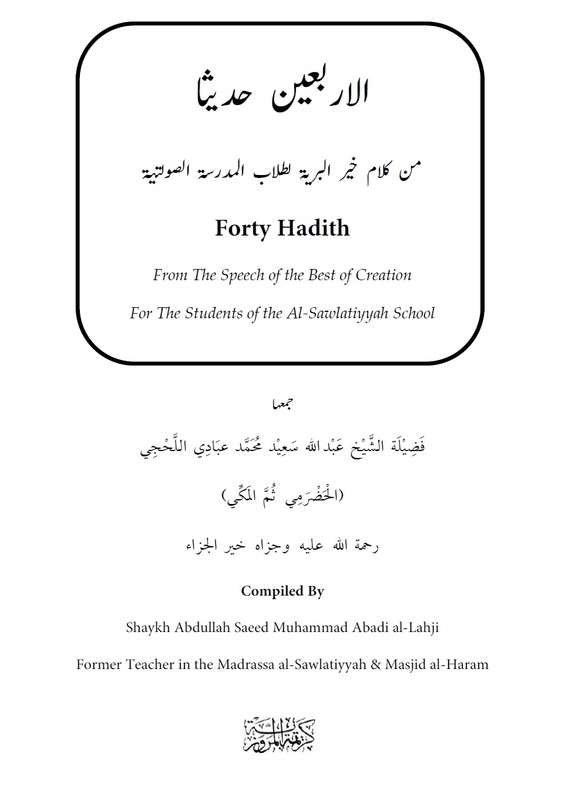 Keeping in mind that this 40 hadith collection is not as well known as other works in this genre, we decided to append a brief Arabic commentary to each of the hadith in the footnotes, mainly to assist teachers and Arabic students studying and teaching this work. We hope to be able to study and complete these 40 hadith in a small circle in Ramadan (inshAllah) and if there is interest perhaps release the work for others to benefit from as well. Note: The above image is that of the cover of the 40 hadith we have just printed.